A relative newcomer to the online poker scene, Full Flush Poker hit the ground running in 2013. 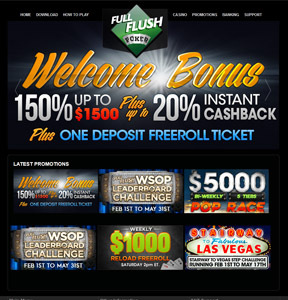 Full Flush Poker is part of the Equity Poker Network, which is run by the people behind the success of several popular poker networks. With a desire to create a no-nonsense poker room that puts players first, Full Flush Poker is always evolving to deliver what players want. Hallmarks at Full Flush Poker include their BIG FAT $15K GTD. That’s $15,000 guaranteed in prize money! Buy-in is $25 + $2.50 , a $1,000 Reload Freeroll that’s free to enter with a $50 deposit, and the bi-weekly Pop Race that features leaderboard prizes for 5 different tiers. Cashout times are fair, but it’s the deposit methods where Full Flush Poker really shines. Players can use Neteller, EcoPayz, Skrill, PaySafeCard, and even BitCoin to put money in their online poker account and hit the tables fast. And our favorite thing about Full Flush Poker? They offer a native Mac client. So whether you love Microsoft or Apple, you’re all set to play.